Getenesh’s research focuses on educating rural mothers in Ethiopia on the use of pulses for complementary foods. 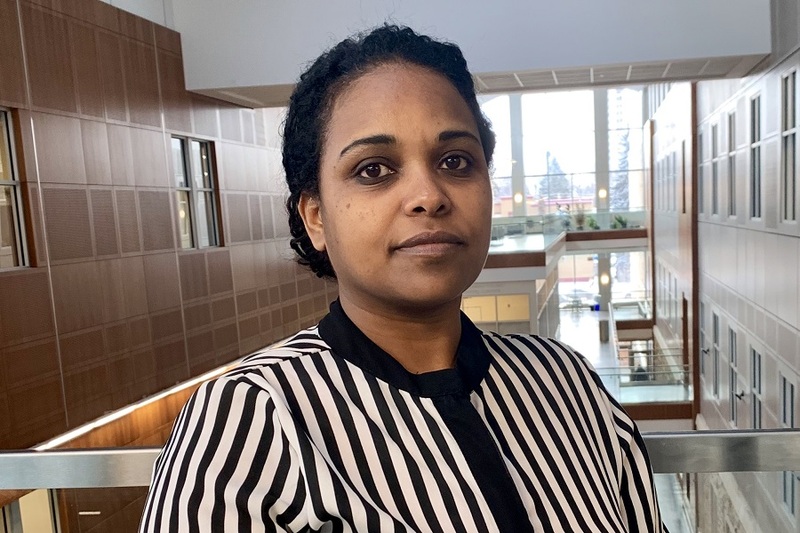 Getenesh B. Teshome is a PhD candidate under the supervision of Drs. Carol Henry and Susan Whiting. She has a BEd in Home Economics and an MSc in Human Nutrition and worked as a lecturer at Hawassa University in Ethiopia. She was awarded the International Dean’s Scholarship and a teaching assistant fellowship from the college. Getenesh’s doctoral research focuses on educating mothers to use pulses in complementary foods and to use soaking and germination to improve the bioavailability of iron and zinc of pulse products. Her research has contributed to empowering mothers by providing information as well as haricot bean seeds to plant for consumption and income. Berhanu, G., Whiting, SJ., Henry, C., Challa, F., Belay, A., Mulualem, D. & Green, TJ. (2017). Assessment of Knowledge, Attitudes and Practices of Mothers' on Pulse Incorporated Complementary Food and Associations with Diet Diversity and Nutritional Status of their Children in Two Rural Districts of Sidama, South Ethiopia. International Journal of Nutritional Sciences, 2(1), 1017. Alemneh Kabeta, Sintayehu Assefa, Dejene Hailu, and Getenesh Berhanu. (2017). Intestinal parasitic infections and nutritional status of pre-school children in Hawassa Zuria District, South Ethiopia. African Journal of Microbiology Research, 11 (31), 1243-1251. Yetnayet, M., Henry, CJ., Berhanu, G., Whiting, SJ., & Regassa, N. (2017). Nutrition Education Promoted Consumption of Pulse Based Foods among Rural Women of Reproductive Age in Sidama Zone, Southern Ethiopia. African Journal of Food, Agriculture, Nutrition, and Development, 17(3), 12377-12394. Mulualem D, CJ. Henry, G Berhanu, SJ. Whiting. (2016) Effect of Nutrition Education on Promoting Grain Legumes in Complementary Feeding in Wolayita, Southern Ethiopia. Ecology of Food and Nutrition. 55(3):308-323. Zebdewos A, Singh P, Berhanu G, Whiting SJ Henry CJ and Kebebu A. (2015) Formulation of iron rich complementary food by using locally available amaranth, chickpea and maize. African Journal of Food Agriculture Nutrition and Development. 15(4). Available at http://www.bioline.org.br/pdf?nd15043. Berhanu G, Mesfin A, Kebebu A, Whiting SJ, Henry CJ. (2014) Household food processing methods to enhance iron and zinc bioavailability in formulated haricot bean and maize complementary food. African Journal of Food Science 8(4): 190-195. Haile D., Belachew T., Berhanu G., Setegn T., & Biadgilign S. (2014). Infant feeding practices among HIV exposed infants using summary index in Sidama Zone, Southern Ethiopia: a cross sectional study. Pediatrics, 14; 49. Haile D., Belachew T., Berhanu G., Setegn T., & Biadgilign S. (2014). Predictors of Breastfeeding Cessation among HIV Infected Mothers in Southern Ethiopia: A Survival Analysis. PLoS ONE 9(3): e90067. Haile D., Belachew T., Berhanu G., Setegn T., & Biadgilign S. (2014). Stability of infant and child feeding index over time and its association with nutritional status of HIV exposed infants in Sidma Zone, Southern Ethiopia: A longitudinal study. Early Human Development 90, 815-820.